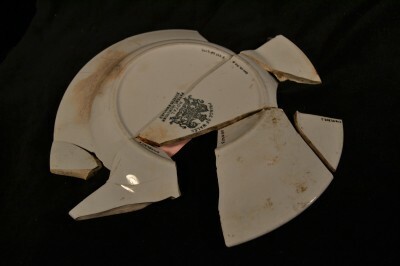 An ironstone plate with a maker’s mark on the base. Despite what we see in museum exhibits, it’s not often that whole, unbroken artifacts are found during archaeological excavations. 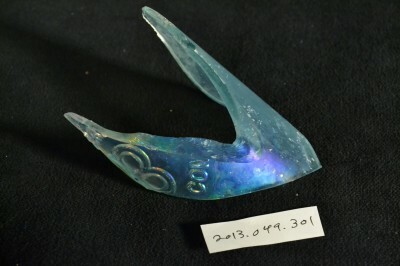 Most of what an archaeologist might uncover during an excavation of an urban site are small, broken pieces of artifacts like glass and ceramic vessels. These pieces are referred to as “sherds.” The archaeological collection from the 1996 JMM expansion has bags and bags of glass and ceramic sherds, and it fell to Carlyn and me to try to see if we could piece them together into complete artifacts! Intern Molly works to mend glass oil lamp chimneys. When sherds have traces of decoration, like painted decoration on ceramics or embossed words on glass bottles, it can be very easy to find matching pieces and “mend” them. It’s also easy to find matching pieces of distinctive artifacts, such as a cup made from an unusual color of glass or a very large ceramic pot. But sometimes it can be much more difficult – one group of artifacts that we dealt with was several bags of small, nondescript clear glass sherds. We were able to tell based on how thin the glass was and the curve of the larger pieces that these sherds came from glass oil lamp chimneys, but even with that knowledge, it was very hard to piece together the sherds! 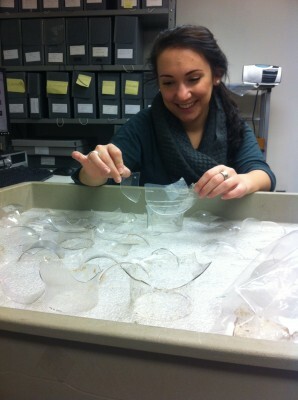 Intern Carlyn admires a mended stoneware pot. We were only mending artifacts so that we could keep records of what pieces go together in the collection, so we used tape to hold pieces together or folded paper and other creative solutions to temporarily rebuild artifacts. 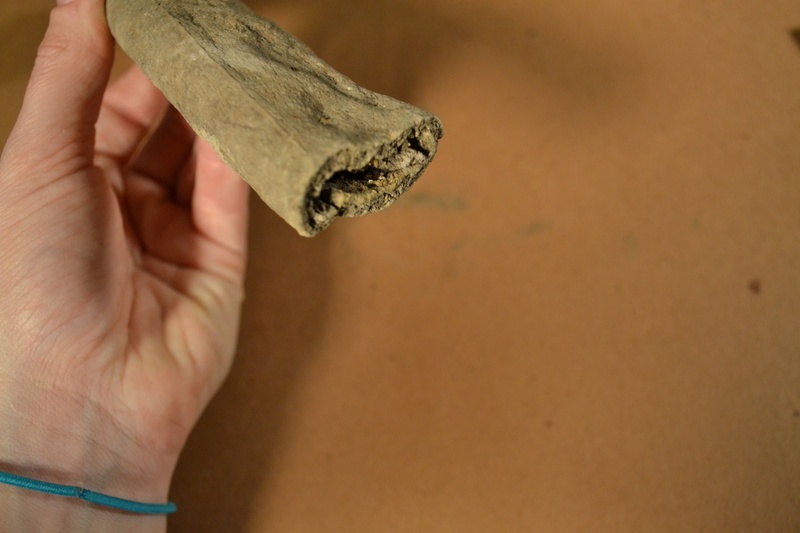 When artifacts are mended permanently, special glues and other archival means are used to mend broken pieces of an artifact to create the attractive complete artifacts seen on display in museums. 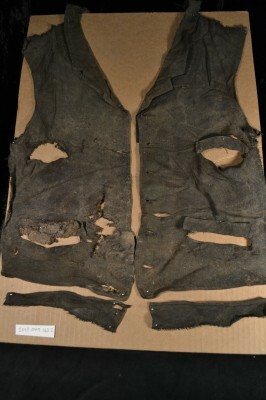 A “mended” 19th century men’s vest with pockets. We also had to work to “mend” some artifacts that were not glass or ceramic, such as a cloth vest or pieces of shoes. At times, mending can be frustrating work, but it’s a lot like doing a very interesting puzzle, and the results when you can piece things together are really amazing! 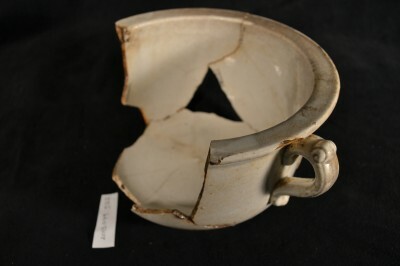 An ironstone chamberpot with decorative molded handles. 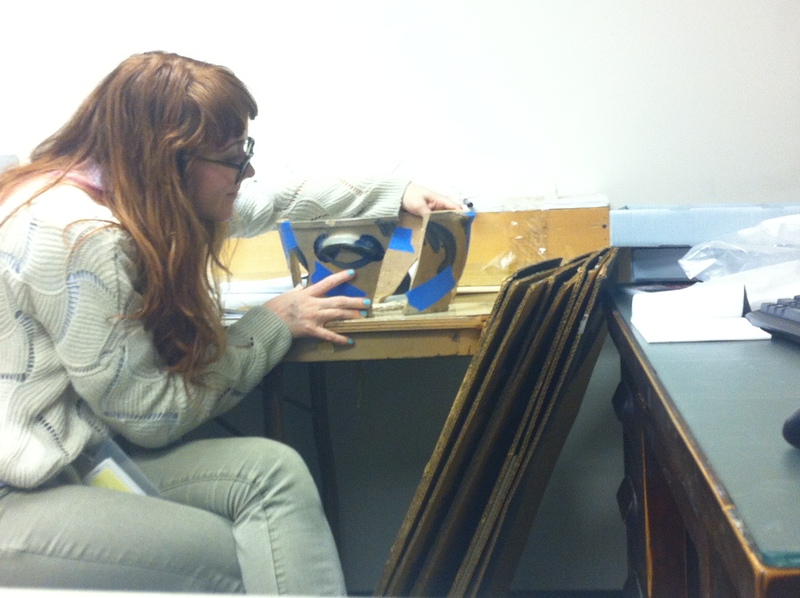 A blog post by Collections Interns Carlyn Thomas and Molly Greenhouse. To read more posts from JMM interns, click here. 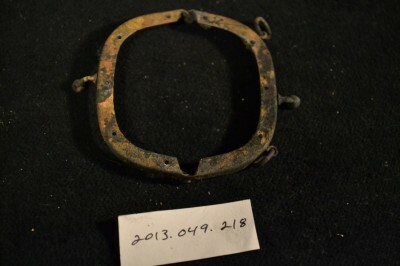 During the expansion of the Jewish Museum of Maryland in 1996 there were many forgotten artifacts and objects that were found in the grounds beneath the land surrounding the museum and synagogues. My fellow Urban Archeology intern, Molly, and I have been examining these forgotten objects, cataloging, cleaning and photographing them. Most of the materials we handle are different fragments of bottles, glass, ceramics and metal, as well as some unidentified objects. 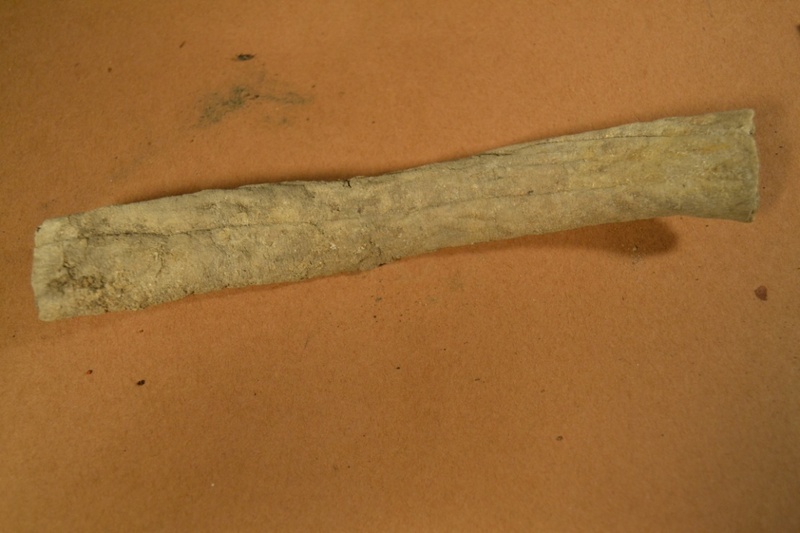 We have been able to identify the genre of most of the objects, and through research we have been able to pin point dates, regions and companies that certain artifacts originated from. 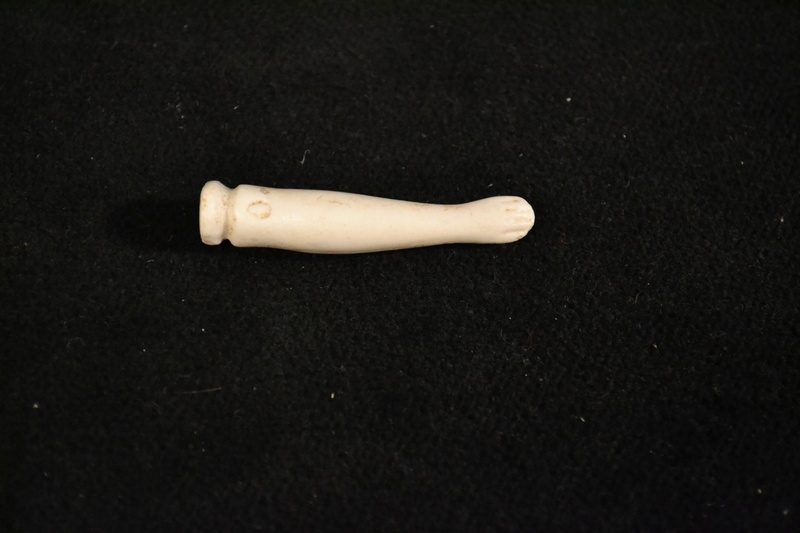 However, amongst the hundreds of objects there have been a handful that we have had to make educated guesses as to what they are, and others are completely miscellaneous and unidentifiable. 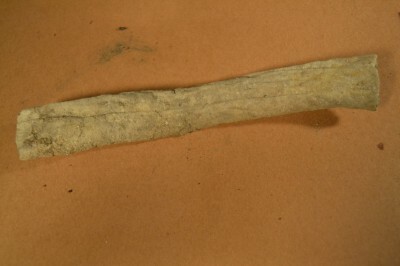 Here are some pictures of individual objects that we believe to have identified, and others which we are still uncertain of. Take a look and see if you can guess what they are, what you think they could be or what it may have been used for! If you have any input, send us an email at jzink@jewishmuseummd.org. Object A: We believe it is the sole of or part of a shoe. Object B: Purse/small bag clasps. 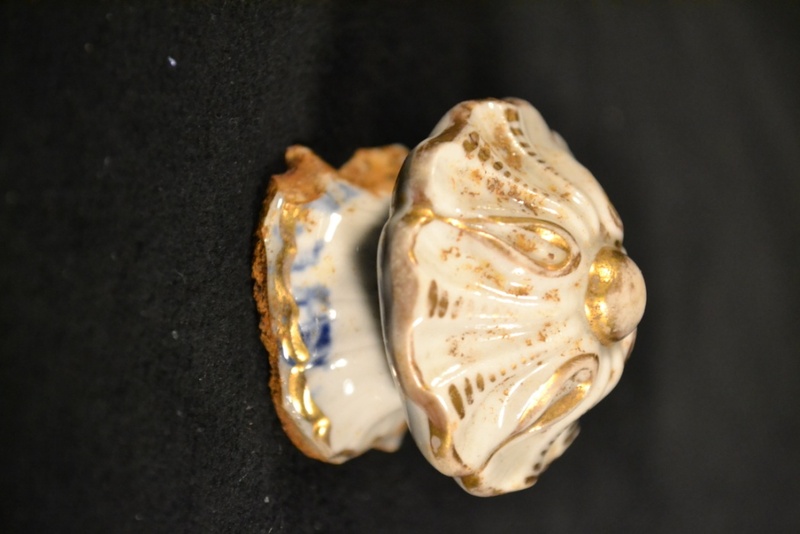 Object C: We believe it to be part of a lid of an ornamental ceramic jar. Object D: We think it is the arm of a small porcelain doll. Object E: We have absolutely no idea what the material or object is or what it was used for. 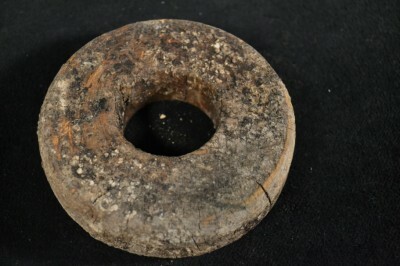 Object F: It is clearly made of wood, but we have no idea what this would have been used for. 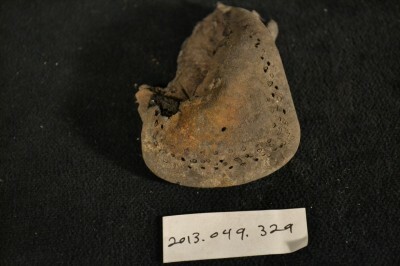 A blog post by Collections Intern Carlyn Thomas. To read more posts by JMM interns, click here. 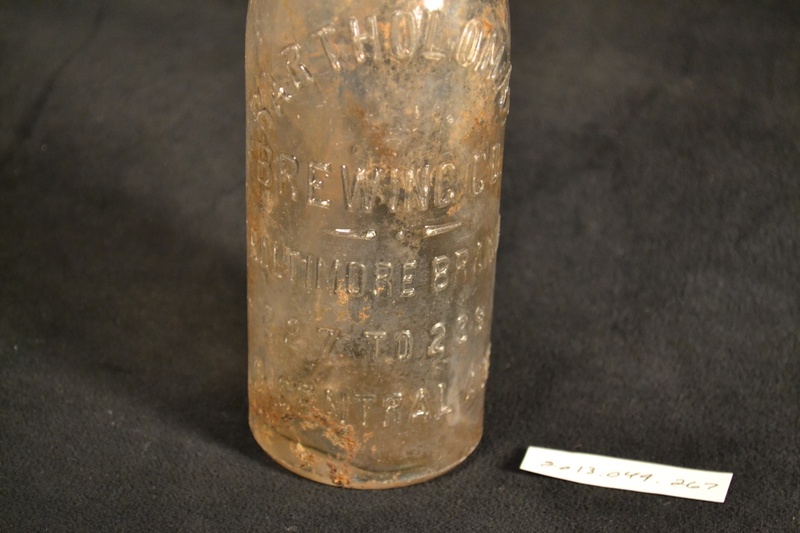 During the expansion of the Jewish Museum of Maryland in 1996 there were many collected and forgotten artifacts and objects that can from the grounds beneath the land surrounding the museum and synagogues. My fellow Urban Archaeology intern, Molly, and I have been taking a look at these forgotten objects, cataloging, cleaning and photographing them. Most of the materials we handle are different fragments of bottles, various glass, ceramics and metal, as well as some unidentified objects. Bottle from the Bartholomay Brewing Company. My favorite finds were the glass beer and soda bottles with embossing on them from various old Baltimore breweries that I dated to 1910 from researching the year of establishment of the name of the brewery. Some names that turned up frequently were the Bauernschmidt Co, American Brewing Co, Global Brewing Co, and Bartholomay Brewing Co. Often, the name would not be embossed, but just a monogram of a letter, and by using various websites we researched what company the particular monogram belonged to. There are also a number of small medicine glass bottles from local pharmacies. Fragment of a bottle from the Bauernschmidt Brewing Company. Now that we have successfully assigned accession numbers to every object and added it into our database, and now we have begun the process of washing, labeling and photographing them! Woo! A blog post by fall collections intern Carlyn Thomas. To read more posts by and about interns, click here.